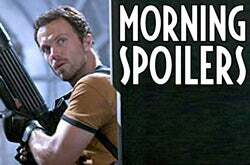 It's mostly television spoilers this morning — we have tons more details about upcoming Lost episodes, including dozens of new stills. And there are three clips from tonight's Smallville episode, plus a partial leaked script for the season finale. But we also have a ton of new details about Splice, the genetic experimentation movie starring Adrien Brody. And there are new puzzle pieces for X-Files 2, Iron Man, Wolverine and Doctor Who. A full spoiler alert is in effect. The Doctor: You've been shot. Ood: The circle...must be broken. Some details about the Smallville season finale, "Arctic," have leaked out. Unfortunately, they're only in Spanish (that I've seen.) Here's what I've been able to glean: Clark is freaking out at the farm, when Kara comes crashing to Earth, with no memory of the past few weeks. She has no clue how to find Brainiac, but keeps urging Clark to go to the Fortress and seek Jor-El's help. Clark says he's tried that, but Kara keeps insisting that they should go to the Fortress, with a weird urgency. Meanwhile, Lex has Jimmy firmly under his thumb thanks to the deal Jimmy made to protect Chloe. And there are some scenes with Edward Teague where they talk about the death of Virgil Swann, and how to use the device Lex found in Zurich. And then Lex tracks down some weird power sources in the North Pole, using government sources.